When the Lab cross died in the Vaughn Mills Parking lot after Woofstock, what I found most disturbing (aside from the entire situation) were the reports that as many as sixteen people were standing around outside of the car, wondering what to do. 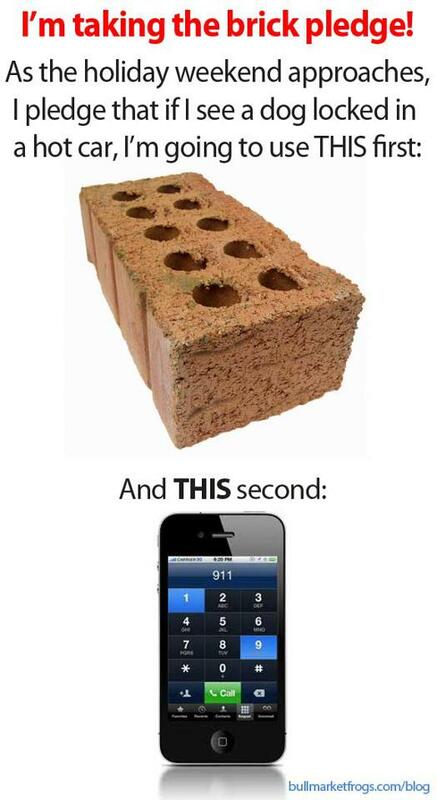 Seemed pretty simple to me – smash the damn window out with a brick. Sometimes, inciting a little civil disobedience is the only way to get the message across. Since the courts don’t seem to do anything to the people who let their dogs die in hot cars, I assume they’ll extend the same leniency to those of us who pledge to liberate them. As always, we had a fabulous time at Woofstock this year. It was great catching up with some of the Bullmarket French Bulldog puppies (yes, they’re all ‘puppies’ still to me – even the three year old ones!) and their owners, and meeting new French Bulldog friends. I missed Ashleigh and Friday, but as you can see from the photo, he managed to keep himself entertained none the less. Not all was well this year, however. Almost everyone who lives in the Toronto area has heard the horrific news of the couple who left Woofstock with their Lab mix and then left him locked in the car while they shopped at Vaughn Mills Shopping Mall. The dog, a Chocolate Lab named Charlie, died of heat stroke. This was the first year that I saw French Bulldogs and Frenchie mixes who were suffering seriously from the heat. In one case, I intervened when I noticed a pied French Bulldog puppy who was obviously in the first stages of serious heat stroke. While I’m sure her parents were left with the impression that I was an interfering busybody, I’d rather they dislike me than hear later on that their dog had died. I am often asked why I won’t ship my French Bulldogs. In a few instances, I’ve actually been berated for it by ‘potential buyers’ who I suppose assume I’m just being difficult, elitist or unrealistic. This is my annual “Hot Weather Kills French Bulldogs” warning post about heat stroke, originally posted Jun 9, 2008. Every year, I think to myself “Please don’t let me have to read news stories about French Bulldogs dying in hot cars”, and every year I am disappointed. Please – let’s make the summer of 2010 the year that NO Frenchies die of heat stroke, and that NO Frenchies are left in parked cars (no, not even for ‘just a minute’). Warm weather is here, and already the stories of French Bulldogs almost dying from heatstroke are coming in. On French Bulldog Z, a reader writes in surprised that her Frenchie can’t walk a mile in 80 weather without almost passing out. I have a 6 month old, neutered, male French bulldog. I love to take walks and Taz is very high energy so along with many games of fetch in the backyard, I try to take Taz for a walk everyday. Today is about 80 degrees out. I would say we walked about 1 mile when Taz was panting and lay down in the grass flat on his belly refusing to walk anymore even when bribed with treats. I waited for him to relax a bit but he still would not walked and looked as though he might be in distress (breathing very heavily) and finally had to call someone to drive us home after trying to carry him some of the way back. My question is how far can a Frenchie walk? I know that they do not like very long walks or very hot days but “very long” and “very hot” means different things to different people. I thought exercise is good for all dogs. A 2 mile walk in 80 degree weather seems like it should be ok for a dog. What signs should I look for to know that Taz has had enough because panting is normal right? Oh dear – A frenchie is not meant to walk 2 miles in 80 degrees!!! Heck, they hardly want to walk around the block in 60 degree weather! It sounds to me like you were VERY lucky that you did lose your Taz to heat exhaustion today! I personally only allow my dogs out for short periods on such hot days and never encourage any exercise if teh weather is over 70 degrees. There have been instances of frenchies overheating and dying in much cooler temperatures. If you continue reading, you’ll get more stories of just how quickly Frenchies (and most other breeds) can succumb to heat stroke, as well as tips on how you can treat it, and what supplies you should keep on hand in case it happens. When we squealed into the clinic parking lot, Keeper jumped out and ran to the door, Corky in his arms. They were ready for her. We filled out some paperwork (and by “we” I mean he did — I was crying in the bathroom) and waited for news. The technician came out within minutes and told us that they had started an IV, had hosed her down (her temperature was elevated) and had put her in an oxygen chamber. They were working to calm her down and stabilize her breathing. Later, when she was breathing more regularly, Dr. Thelan came and talked to us. She had heat stroke, he said. She was better, but not out of the woods. There was a danger of going into shock and bleeding out. That condition was rare, but always fatal. On the French Bulldog L mailing list, a French Bulldog handler and breeder with years of experience is shocked when her friend’s dog goes down from heatstroke at an outdoor show, in spite of all their warm weather precautions and preparations. I watched, as my friend’s beautiful Frenchie boy almost lost his life to this horrific heat wave we’ve been having here in NY. We had just finished showing. Thank God it was still early morning, but I think that was our false sense of security. We were walking back to our cars, laughing, joking when all of a sudden this poor boy vomits, then falls over not breathing. Thanks to quick thinking handlers nearby, they had a bucke of ice water and started pounding on his chest to revive him. His handler was there and bravely stuck her fingers in his mouth to pull his tongue out of the airway. Unfortunately, because this boy was seizing as well, she was bitten pretty severely on one of her fingers. I don’t know as of this moment how she is. However, Whatever they did, it worked. The show vet showed up and they continued working on him until his temp came back down. It was THE scariest thing that has ever happened at a show for me. The show committee crew did an outstanding job coming to our rescue with golf carts and people to help. This boy was stabilized, went to his vet and is resting comfortably now at home. We are not stupid owners. We had cool coats, we had coolers with spray bottles, ice water, the works. It happened SO fast and he gave no outward warning that he was having trouble. I learned the hard way what to always have on hand in my tack box. Nutra Cal and lemon juice. I stopped by and got some on my way home. My personal experience with heat stroke came years ago, with our Bulldog, Daisy. It was a muggy and overcast day, and the weather didn’t seem that warm to me. I was washing the kitchen floor, and decided to put Daisy and the other dogs outside until it dried. Less than five minutes later, I saw she was panting uncontrollably, and knew she had heat exhaustion. I put her in the tub, and ran cool (not cold!) water over her, while letting the tub fill. I payed special attention to anywhere blood flows, including the stomach and genital area. I also put cool towels on her head and across the back of her neck. I did not let her drink any water, or try to force any on her. Next, I used a small (1/2 teaspoon) squeeze of lemon juice to cut the phlegm in her throat. Since she was still panting heavily, I administerd a cool water enema, which helps to cool the body temperature from the inside out. When her breathing calmed, I gave her a weight appropriate dose of children’s benadryl, to reduce the swelling in her throat. At this time, I allowed her a few sips of cool water. Since I know have more knowledge on this sort of trauma can lead to shock, I’d now administer a small amount of nutracal to help prevent this once the dog was calm and breathing fairly easy. We have an info sheet on heat exhaustion and heat stroke on French Bulldog Z, and suggest that all dog owners – and flat faced, brachycephalic breed owners in particular – prepare themselves to deal with heat stroke in their pets. You must realize that ambient air temperature is not the only factor to consider when deciding it’s it hot enough for your French Bulldog to be at risk. Think about walking across sand, or pavement, in the cool of the evening after a hot day, and how hot those surfaces remain. Your dog, being close to the ground, is absorbing all of that ground heat. Remeber that dogs do not sweat, and can only cool themselves by panting, which is made more difficult in humid weather, or when they are a flat faced breed with a shorter airway system. In short, never, ever assume that just because you think it isn’t ‘too hot’, your dog will agree. Your dog’s life depends on your being careful, and on your being prepared to deal with heat stroke if it happens. If you’re going someplace in warm weather where you can’t carry this kit, you need to ask yourself – is it really worth it? Can I get my dog from here to a vet in time to save their lives? Am I completely confident it is not too hot for heat stroke to over take my dog? If you even suspect the weather may be warm enough to be a risk to your dog, put them in a cool coat. By the way, those handy with a sewing machine can make cheap, easy cooler coats with just a terry cloth towel, some banding material, and velcro. Finally, and above all, never, ever, ever leave your dog in a parked car when the weather is warm. Temperatures in a parked car can soar to life threatening on even mild days, and even if all the windows are opened. Do not risk it. Our Amazon Store has hot weather essentials and treats. Amazon donates a few cents from everything your purchase to Eastern Canada French Bulldog Club. The St. Louis area professional handler responsible for the deaths of seven high priced show dogs has been charged with animal cruelty.